Posted on August 19, 2013 at 10:56 am. Everyday on the train to work, I immerse myself in the smoke-filled, whiskey- laden ambiance of the advertising world of 1960s New York. I’m watching Mad Men from the very first episode on my tablet and I’m hooked. The character of Peggy Olsen is particularly fascinating to me. This independent yet vulnerable woman begins as Don’s secretary and works her way up to become a copywriter. We watch as she tries to negotiate a male-dominated workplace where women are supposed to look pretty, type letters and fix drinks. We witness Peggy’s first steps up the creative ladder in Episode 6 of the first Season. She lands an opportunity to write copylines in a campaign for cosmetic’s company Belle Jolie. A series of ads are created featuring a close-up of a woman alongside a man with a lipstick mark on his cheek. The tagline is “Mark your Man”. The idea is that the discerning lady picks one lipstick from the ‘basket of kisses’ to represent her identity. And she then uses her kiss to mark her man. The smooth-talking creative director, Don Draper, tries to sell the idea to the client: “Every woman wants choices, but in the end, none wants to be one in a box of a hundred. You are giving every girl who wears your lipstick the gift of total ownership.” The ad men hope that their target audience won’t realise that the extent of the choice is limited to lipstick colour. All they are being sold is the illusion of freedom. 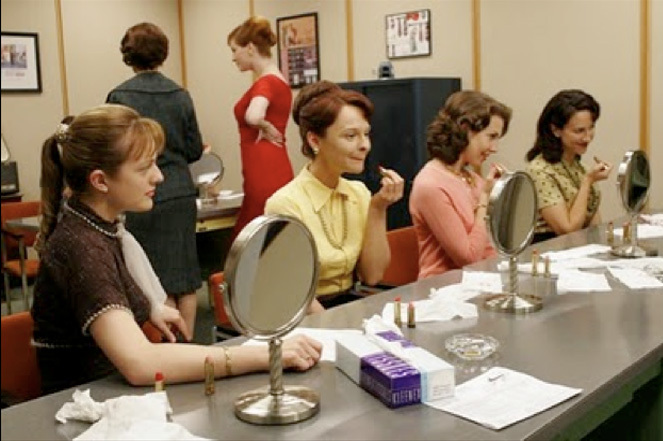 We’d imagine that the focus and nature of advertising to women has changed a lot since then. What’s the reason for the eternal pursuit of beauty according the ads for shampoos, makeup and handbags in the glossy magazines and on TV these days? According to L’Oreal, at any rate, it’s ‘because you’re worth it’. You deserve the glossiest hair and the prettiest lashes just for being you. The message is that you buy the products and put the effort into looking good for your own benefit. However on closer inspection, it seems that sisters are not always doing it for themselves. According to one of the Madmen, advertising to women is “about how they want to be seen by us – their husbands, their boyfriends, their friends’ husbands.” This idea forms the premise for a recent ad for Clairol Nice n’Easy hair color which carries the tagline: “All he’ll see is you.” The male character marvels at how his wife, a silent long-locked beauty called Kate, still manages to look beautiful after fifteen years of marriage. The warning is there, lurking beneath the hair swishes: Ladies, don’t let yourself go, keep those grays at bay and above all else – keep your man happy!